Ranim posted a message on Should Druid come back? It should come back in an expansion, but not vanilla, doing it now would cost several precious months. Ranim posted a message on Changing your mind on the visuals....? But the people that say everything is fine as is fail to realize that no matter what the gameplay is going to be good because they know exactly what they're doing on that and that following suit with the people for an artistic reform only means improvement to the environment and indeed the quality over all. It's a win/win for the gameplay centered people really, it's both fun to play and really freaking beautiful. The people obsessed with lore will get nothing but what they're expecting, they've laid out the perimeters for that already, rest assured. It's not those people that are against the reform the most, it's the impatient people. The people that don't care what it looks like, as long as it's up to the blizzard standard and fun. They are an afront to the potential of this game, and just because the Blizzard community dared put a hand on blizzards shoulder as if it's insulting for the community to remind the makers what they're doing something wrong. As it's us who will feel the burn if we let those people silence the dissent, it's our money they're getting, would you want lemonade that's 80% lemonade mix and 20% Water? No, that's a terrible product, it could have been good lemonade but it's his first time trying this, his brother was better at it back in 2000 but this time after mixing world of orangecraft for so long he tries Diabloaid and does it wrong. No that cannot be permitted, we must help him make the best lemonade he can. Ranim posted a message on Guns in Diablo 3? Maybe? So I remembered a long time ago one of the gossip dialogues that Qual Khek dishes out. "Larzuk is a talented blacksmith, but his head is full of some strange ideas. Just the other day he came to me with a plan to break the siege. He wanted to fill large pipes with exploding powders and steel balls, and then, well, *chuckles* well, like I said. Strange." They might write this out as nothing and it might even be nothing but it got me thinking... they mention that it's been 20 years, story wise, perhaps guns will make an entrance but be endgame. I don't quite see how it would fit into a ranged archetypes skill buffer though... Also when I say Gun, I am NOT refering to assault rifles or any 19th, 20th, or 21st century weaponry. I am refering to weapons such a muskets, matchlocks, and hand cannons (ball projectiles, not BULLETS) the basic of basic firearms. The notion of guns is entirely plausable. and I have proof of this possible inspiration. Know one thing however, I doubt highly that firearms will make an entrance, I think it would be anoying to have guns as a useable item. I am just entertaining the thought, as thinking from a singular opinionated moot goes nowhere. The following is suggesting that Larzuk got his inspiration from travelers or that the idea was lingering in the world or from a lost asian culture in sanctuary, not mentioned ever in lore and that the mixture of cultures through time is so large that anything is possible. First off you have to take into account that Harrogath and the outlaying area was completely devestated. It is safe now and people have begun to return to the area. Even though 20 years later it would seem that the ecosystem has been completely devestated to the point that large sums of land have sunken beneath the sea. This could suggest even moreso that he and the inhabitants have evacuated the area and headed south, away from the dreadlands. If you play Diabo 1 you may notice that Katanas are present. This is an asian weapon design. There are many other items that are clearly asian aswell in Diablo 1 and some that are not so clear, since the difference is slightly blurred as Europe begins trading with the East more and more. The Diablo 2 items are harder to identify but I believe that I have found a few, I may be wrong on a few of them, but I am sure that the Diablo 2 Splint armor is an eastern armor style. I grabbed what I thought was Asian, Including Indian as they are on the fringe of being what we know to be asian. I can't stress this though, these are just examples, I'm not trying to be exact, I am only trying to make a point. There is a question that I cannot answer, and that is: Why would a remote town like Tristram have such items and even more so, why does the rest of the world seem to not? The asian designs were not just limited to Items, there was an entire class with Asian and Far Eastern elements all throughout it. The assassin was quite possibly the most direct emphasis on the Far-Eastern element, everything about her except her appearance was relateable to asian styles, her armor style, her weapon of choice, and even her skill tree. She had 3 distinct trees full of asian elements, The entire Martial Arts tree was chalked full of Chinese hand to hand combat moves such as the Tiger Strike, Dragon Talon, Cobra Strike, and Phoenix Strike. Her Shadow Diciplines were clearly inspired by Japanese Shinobi myths, such as the Shadow Warrior and Master (Shadow Clones), the Cloak of Shadows (Invisablity), Mind Blast (Psychic), and Claw Mastery. The assassins Trap tree seemed to be a generally asian themed tree. The assassins Trap tree is probably the most important one to note, as it relates quite a lot to the production of firearms, first of all the Fire Blast isn't just a cup full of gas it's a chemical reaction, this leads me to suspect (If this class is indeed an Far-Eastern themed class) that this means that what ever this unknown element in the world is, it's fully aware of the mechanics of explosives and engineering. The rest of the tree is the most important, if you look at the traps closely you see a turret with 4 legs laying flat on the ground, this may be just a simple magic item but I do not believe this is true. It has been said that these assassins are afraid of magic, as they believe outer unfluences corrupt, I think this is something mechanical in nature. Many of the skills, albeit clearly magical in origin or not, uses Mana as a medium to make the game move on, many people say that because the traps require mana, they must be magical in some way. I believe that this theory is incorrect because as you look at it, and as it breaks up it's clearly not a simple element like lightning or fire, it has a solid mass, magic cannot create something solid like metal or wood, save for ice. I believe that in cases such as the Barbarian and the Assassin, that mana was simply a medium, not a cause. Everything was clouded up until this point. 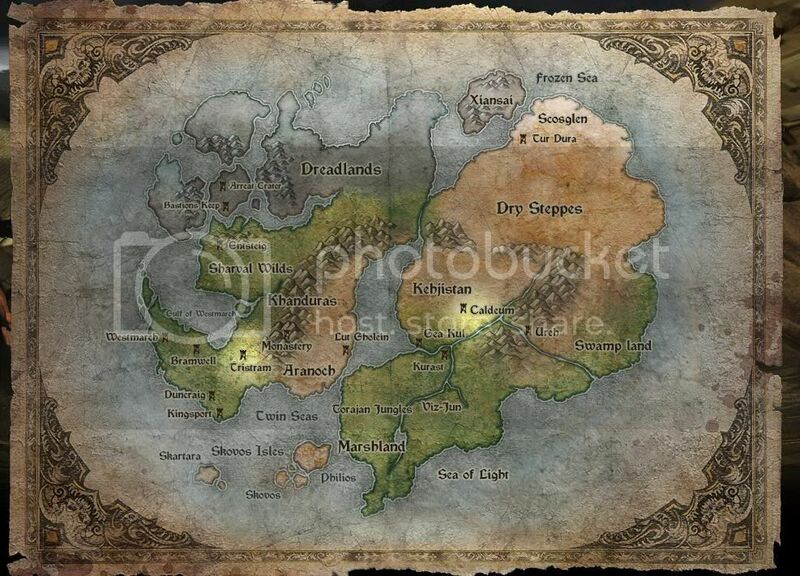 This first photo is the Diablo 2 world map and the third is the Diablo 3 map, seen on the website. If you notice, the East is cut out on the Diablo 2 map but the Diablo 3 map isn't like this, also, that northern island is given a name: Xiansai. 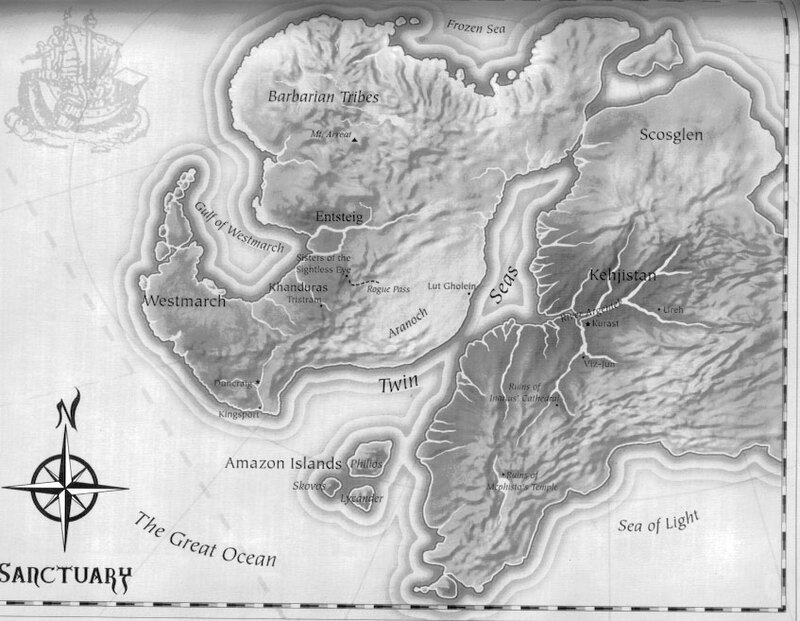 Going back to the items and asian element, the Diablo 3 team decided to identify the eastern end of Sanctuary as coast, cutting off that potential expansion, it is possible that the original team wanted to explore more this direction and as a compromise the third games team decided to name that northern island Xiansai, to replace a potentially entirely new portion of the continent of Sanctuary. It always struck me as odd, why the stories of the Sin Wars say that the world of Sanctuary was created by Demons and Angels, and yet throughout sanctuary you see no Demon elements, no signs of the demons beyond the wild creatures. It could have been that when the Angels and Demons migrated to Sanctuary that they divided themselves into two different areas because I highly doubt that angels and demons would have continued to live on after the demons tried to raise an army of Nephalem. I personally think that the original team that created Diablo 1 intended to explore that unexplored eastern side of sanctuary but never got around to it, however I have no evidence to back this theory up. Evidence that futher suggests that firearms are plausable, there is an added asian element into the game that is not discussed, Asia had flame throwers and gun powder, as well as missiles as well as pass producting capabilities for a thousand years before the time that Sanctuary is set in. If Larzuk is suggesting such a weapons he must have gotten the idea from somewhere. This is all taken out of context, we were speculating what Xiansai stood for and I brought up Diablo and his rebirth. It's somewhat relevant, I am suggesting that an asian element has existed since before there was information on them. People have said that magic could influence the way technology developes. I doubt this to be honest. Inarius, the man who created the Worldstone, pleaced a curse on the first generation of humans that would diminish their power over several generations. A smithy isn't going to be a magician. Those kinds of people are contained into Cults, Orders, and groups as such. They are a minority. The way that people develope technology is based on their survival and human curiosity. It is my view that it would not hinder the developement of Firearms for the regular person, and if anything the groups layed all throughout the world would try to find ways of augmenting it to work hand in hand with magic to somehow concentrate magic into a projectile. The armor and weapons, as well as the weaponized potions supports the potential of firearms and artillery existing in the game. 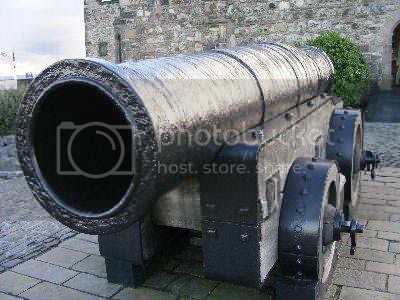 It is in my opinion that the entrance of primative cannons and hand cannons is plausable. But as to if it would fit, I don't know. That is up to Blizzard to articulate if they choose to. The following are the weapons that I am suggesting are possible, pictures are taken from LinkX's post on page 20, as well as examples found on the internet. Additionally, we must think of how the Crossbow functioned, it had a 2 second attack speed and yet the weapon in reality takes at least 25 seconds to reload a crossbow, additionally it requires a lot of strength so crossbowmen tended to reload even slower than that in the midst of a battlefield. A gun could take 3.5 or more seconds to reload by default and still fit the game, no matter how long it takes to truely reload. We all think that we're just going to stand still and attack with a ranged weapon but what about hit and run tactics? Does this not help give the gun a place since all us ranged folks did that anyway in Diablo 2? There is also a historical element that is being overlooked, and it takes its personification in one class, the Amazon. The amazon is a greek mythological tribe of women who cut one breast off to fire bows and arrows, this preceeds the time in which Sanctuary by at least 1500 years. And yet this ancient myth is mixed into the world. This is a clear mixture of styles. We all say that Diablo has its roots in Medieval europe (Around the 1300's to be exact), well I do not believe that this is true, I think that each culture is stylized to an ideally focal point. Though each culture has been somewhat related but very different, they all appear to come from many different time periods. I'll give you 2 more examples of ancient themes taking place in the world of Sanctuary. The Necromancer and the Druid. These two classes are just as old as the Amazon. The Druid is Celtic, ideally stylized about 1000 years before the time of Sanctuary. This is Blizzards game, they can say what ever they want about this, they've already said it about world mechanics which I will quote below from his critique of the photoshopped photos. That quote makes me think that they'll put what ever they want into the game, regardless of era, only if it fits and guess what firearms fit and I think that they will make an appearance, albeit in or out of the characters hands. Though I do not support idea of Firearms in Diablo 3, I do see the possability, but it would have to be well thought and executed and I do not believe that the diablo 3 team is capable of that. From that. I ask you to draw up your own logical conclusions. The prospect of guns threatens many fanboys of the Diablo Universe, they have said that it will turn Diablo 3 into Hellgate:London or even Pirates of the Caribbean, why would they choose such a theme anyway, maybe that was on the minds of the few people from Blizzard Norths Diablo 2 team that migrated to Flagship. Maybe and maybe not. But remember people, the world of sanctuary's style was based off of medieval europe, Ottoman Turks and supposed South American/Central American culture and the savage tribes of the eastern european barbarians (now russians) stretching over thousands of years. There is no telling how these cultures intermix through trade and relationship. 20 years is a long time, things can change quite fast, and also remember that we only saw a small portion of the world, the weapons could have been present in a few city ports (as the sea is the most logical way of spreading technology from far away in a pre industrial era. This mixing of cultures and time periods makes me wonder if the way that technology changes over those 20 years, are guns out of the question? I wish the whole game turned out to be a carefully orchestrated illusion where you really did go to those places, but what you saw was different, and you were the one who killed Cane, and you were the one who Injured Imperius, and you fought at the wall and defeated Azmodan, as an unknowing agent of Belial. That would make the mess we're left with brilliant. Everything you see is what they want you to see. Everything you do is what they want you to do. Everything you think you know, is a lie. Nephalem, you are indoctrinated. Hmm, the Wizard thinks some book had them as this hero of Prophecy. The Demon Hunter had their family killed and a group of hate-filled killers recruited them. The Witch Doctor was sent on his quest by the spirits? I don't remember the Barb/Monk pre-story, I think the Barb was looking for the ultimate challenge or something. Expansion starts with a cinematic of Deckard Cain and the surviving Diablo 2 heroes ripping you out of a demonic torture chamber. "By the Light, what have those fiends done to you? At last, I was able to decode some of the ancient Horadrim prophecies, which led us to you, but I fear I may have been too late. Dead? No, my friend, I can assure you I am quite alive! However, if we do not act swiftly, I am afraid we shall all be headed for the Unformed Lands! " You stagger forward, eyes set on an open doorway with sunlight pouring in in the distance. The sounds of battle echo off the caverns walls. You fall to your knee, a tired-looking Amazon and sullen Druid support you as you shuffle towards the exit. The camera pans out over a devastated wasteland down below, a horrendous battle is waging. The rivers run dark with the blood of the fallen, the bodies of angels, demons, and men, litter the ground as far as your eyes can see. In the skies, the angels and winged demons clash in a beautiful display of aerobatics and death. The poor souls that are wounded and sent earthward in this deadly aerial battle are torn apart by the frenzied forces on the ground. You stagger back from the doorway, a bright light shines behind you and you feel an armored hand grip your shoulder. The Archangel Tyrael, Aspect of Justice, looks at you with the black void that is his face, "Nephalem, I do not know what lies the demons have been feeding you, but we haven't much time. The final battle is upon us, whoever triumphs on this day shall be the victor of the Eternal Conflict. Come, Nephalem, the hour of your true destiny is at hand."